Lukban family website to raise awarness of great achievements of Lukbans past, present and future. Our forefathers laid the ground work for our success by giving us all a prestigous surname. It is up to the current and future generations to bring our family higher level of successes and achievements. NOTE TO VISITOR: IF YOU HAVE NOT DONE SO, PLEASE ADD YOUR NAME TO COMPLETE OUR FAMILY TREE. 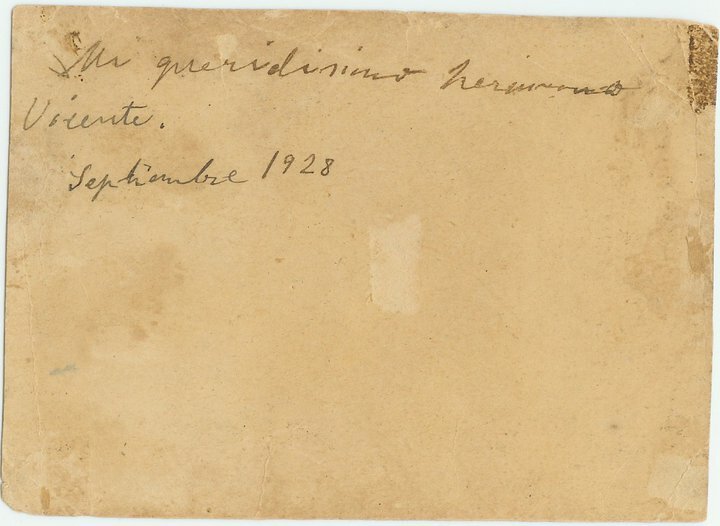 Dedication a the back of a picture of Gen. Vicente Lukban from Rafaela Lukban written in spanish " Mi queridisimo hermano Vicente" translated My Darling Brother Vicente. Simply written and shows much reverence amongts the siblings. Its an opportune time to reflect on unity and pride amongts all the Lukbans..
most of Lucban’s old families descended from the Villaseñors. Don Jeronimo Venco came to the Philippines in around 1690 not to settle here but to court and marry a Chinese meztisa of Pagsanjan by the name of Doña Juana Dinio. Her surname remains to this day a prominent patronymic of Pagsanjan. It was about the same time when the town had just become the capital of Laguna (1688). The marriage was apparently arranged since as noted earlier, Pagsanjan had been founded by Christian Chinese traders, one of whom was surnamed Vinco or Venco, probably an unlce of Jeronimo. Indeed, Dinio means “a lady who is related by blood”, “nio” being equivalent of the Spanish Señora or Doña. Jeronimo bought his bride back to Seongue where they begot two sons who reached maturity. The first, named Christoval Guico was born on February 2, 1692 while the second, also christened Christoval de Villaseñor, was born on November 21, 1694. San Christoval (St. Cristopher) for whom both sons were named was the saint who carefully bore the Christ Child on his shoulders while crossing a formidable river. Looming over the Tagalog provinces of Laguna and Tayabas (now Quezon) is the sacred volcano Bundok Banahaw. To San Christoval the missionaries dedicated the three mountain range. The terrain was reminiscent of Fujian except that the mighty mountain here dominated without limiting the landscape. When a light glowed on the mountaintop in the still of the night, it was believed to be San Christoval leading a lost soul in the right path. The pious legend and the luminous landscape fired Jeronimo’s spirit. He named his two sons for the saint although neither of them was born on his feast day (July 25). Jeronimo apparently concluded that its was San Christoval who guided him safely across the stormy seas from the mainland to the Philippines and back with his young bride. And should the two sons decide someday to reclaim their maternal heritage in the Philippines, it would again behoove San Christoval to protect them from all the dangers along the way and help them to find the path to Pagsanjan. In regard to the two sons’ surnames, Guico translates precisely as “Lord Elder Brother”. According to family tradition, Villaseñor, which means “Lord of the Village”, indicated their noble status in the old country, which made it an agonizing decision for them to cast off their deep roots. Of the huddled masses they were not, though to be sure they had enormous empathy for them. Villaseñor was probably adopted from a Spanish god father or padrino of the family. It was however, a rare surname among the Spaniards in the Philippines. It took the faithful brother almost half a century to finally decide to migrate to their maternal country in 1740 when they were already in their middle life. Both of them must have earlier families. In that era, most people in the Philippines and perhaps in Asia too, died in their 40’s or 50’s or even earlier. But in the same age range, the hardy brothers decide to start their lives all over again. Determination and perseverance were two profound values they would pass on to their descendants. What major force drove them to make the perilous step is mentioned neither in written accounts nor in the oral tradition of the clan. Perhaps, the four Horsemen of the Apocalypse—war, famine, pestilence, and death, had descended upon their land. But their unswerving trust in the Divine Providence through the intercession of their common Patron, San Christoval, helped them remained steadfast in their resolve. Greater problems were awaiting them in the Philippines but San Christoval appeared never to have failed them. They arrived just when the Spanish Government was beginning to curb Chinese proliferation in the colony by restricting migration and expelling illegal aliens. But no matter. Clandestinely, the instant fugitives change course from Pagsanjan to Lucban where they knew the missionary Fray Gines Cathos and some Chinese families, probably relatives, who gave them refuge. Nestled at the base of Mount Banahaw, the seat of San Christoval, Lucban beaconed like a blessed light. By then the authorities issued warrants for their arrest as common criminals subject to “beheading” (degollacion) if found guilty. Other crimes must have been imputed to them. The merciful Fray Gines hid them in the inner recesses of the dome gallery hovering over the church transept. The stone church of Sam Luis Obispo of Lucban had just been completed seven years earlier in 1733. In the meanwhile, the Franciscans and the influential Chinese meztiso groups of both Lucban and Pagsanjan mobilized and worked together for their amnesty. They did succeed but probably without being able to avoid giving bribery to key officials. 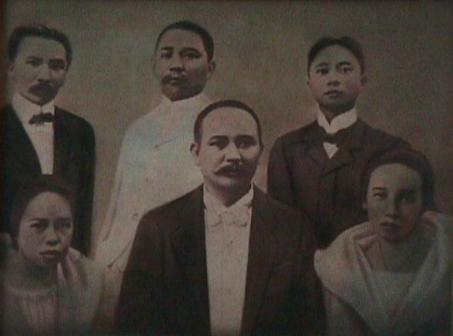 The facts that the brothers Christoval were Chinese Catholics whose mother was a native of Pagsanjan and thus, they were partly Filipinos would have helped their case immensely. In the testimony of their faith and parentage, they had carried their baptismal certificates all the way from Fujian. Although the original documents had disintegrated, the date they contained were copied for posterity by devoted descendants. No sooner had the following year started than a monstrous earthquake demolished the church of Lucban on January 12, 1741. The dome over the transept, which had sheltered them, collapsed to the ground. In gratitude to San Christoval for their deliverance twice over, the brothers vowed to carry on from generation to generation in their adopted town their family tradition from the old country of assisting the destitute and the desperate which they too had been once before. Because of their nobility and mettle, despite their age, the brothers Christoval were deemed eligible old bachelors or widowers by their hosts and supporters in the Chinese meztiso community in Lucban. One of them was Don Luis Pangco (whose srname translates as “fat lord”) with his wife, Doña Juana Flora. The affluent couple had two daughters, Josefa de la Cruz, and Ana Urbina. In 1743 Mount Banahaw of San Christoval erupted (for the last time in recorded memory) burying the town of Sariaya in the South but largely sparing Lucban in the Northwest. It was indeed a propitious event. The following year the elder Christoval took to wife Josefa. And two years later in 1746, the younger Christoval exchanged vows with Ana. Thus, began a new chapter in their lives as well as in the history of Lucban. Their children and descendants were officially classified as Chinese meztisos. It should be noted, that there are two types of Chinese Meztisos in the Philippines during the Spanish Period. The first type was the offspring of a Chinese father and a Filipina mother, who therefore was an exact half-breed. The second type was the child in a family which had been classified for generations as Chinese meztisos in the direct male line regardless of the amount of Chinese blood running in their veins since the race of their maternal lines were not taken into consideration. The children of the brothers Christoval belonged to the first type while their grandchildren and their descendants afterwards pertained to the second type which was the most common by the 18th century. Unlike in Pagsanjan, there was no separate Tribunal (Municipal hall) nor gremio for Chinese meztisos in Lucban. They and the naturales met together in the same hall and as members of the principalia, they took turns serving as mayors of the town. In the process, the Villaseñors perfected the art of prudent interpersonal relations or pakikisama with both the natives and the Spaniards, which the clan has been known for. Don Vicente, and Don Marcos (married Doña Eugemia Isabel). All of them, following the Chinese custom, took their patriarch’s first name as their surname, Cristobal as spelled in the new orthography. Their progeny intermarried with their Villaseñor relatives, mostly distant cousins, despite the Chinese probation of consanguineous marriages in the paternal line. (There was, however, no probation of marriage in the maternal and paternal-maternal lines) They were able to circumvent the ancient ban by a technically: the two branches of the clan now sported different surnames, which dissimulated their paternal relationship. Besides, canon law of the Catholic Church permitted consanguineous marriages with special dispensation. Hence, the two branches were reunited more than a few times in the 19th and 20th centuries like the noble families of China and Europe, which probably pointed to their noble background in Fujian. The descendants also intermarried within their own branch. More typically, however, ther intermarried with other prominent families from the Gremio de Naturales as well as the Spaniards and Spanish meztisos, a fact; which widened the interpersonal ties and contributed further to the hybrid vitality of the two clans. The Cristobals moved fast in the social ladder of their adopted town. Presbitero Don Pio Cristobal, the eldest son of the eldest son (Juan), ascended the altar of God with the priestly dignity—a sure sign in those days of family prestige. In 1819, Don Marcos Cristoval, the youngest son, became the first of the clan to be elected by the principalia as gobernadorcillo (mayor) of Lucban. Marcos’s son Don Saturnino Cristobal Rilles also became the town executive in 1840. It was he who ordered the religious image known as Santo Sepulcro (the dead Christ in glass coffin) to be sculpted. Since then, it has been used on Good Friday processions and considered miraculous by the town folks, who call the image Mahal na Señor (Holy Lord). From Don Saturnino descended the prominent Lukban clan of Manila and Camarines Norte whose surname honors their ancestral town. Saturnino’s daughter, Andrea married Don Agustin de San Miguel who changed his family name to Lukban in 1849. In that year, Governor General Don Narciso Claveria, Conde de Manila, ordered the customization of Filipino surnames. The majority of the Filipinos chose or changed their patronymics to Spanish surnames. Only a small minority, like Don Agustin, went against the current. We now come to our direct line of descent from the younger brother Don Christoval de Villaseñor. Five children were born to him and his wife, Doña Ana Urbina Pangco: Don Blas Mariano (born on February 3, c1747 and married Doña Juana Micaela de Luna); Doña Maria Dominga ( born August 4, c 1748 and married Don Santiago de la Cruz, who later adopted the surname Eleazar and served as the mayor of Lucban in 1787); Doña Maria Lina (born on September 23, c1750, unmarried); Don Antonio Serapion (see data below), our ancestor, and Doña Anastacia (born April 15, c1755, unmarried). The Eleazars, descendants of Vicente and Maria Dominga, have led the way in celebrating a grand reunion last year, 2002 in Lucban. They published a two volume work of their on their genealogy and lineage. We, the descendants of Antonio Serapion, are now following their edifying example this year. As explained earlier, some of the Eleazars also descended from Antonio Serapion. It is recorded that the manse of the dowager, Doña Ana Urbina burned down in the Great fire of 1789 in Lucban. She took refuge in the house of one of her married children. She probably died a few years later. Don Antonio Serapion de Villaseñor, the second son of the second son, was born on February 25, c 1752 (feast of San Serapion, Martir) and died in c1812. He married Doña Lina de la Rosa who apparently died young and childless. On September 7, 1791, the widower remarried to a 19 year-old town mate, Doña Rosa de los Angeles. She was born on March 2, 1772 and died in c 1825. They were blessed with eight children: Srta. Doña Cayetana de Villaseñor (born August 7, 1792, unmarried); Don Fernando de Villaseñor (born on May 30, 1793 and married Doña Martina Solueta de San Antonio); Don Silvino de Villaseñor (born on February 7, 1794 and married Doña Micaela de San Agustin of Tayabas, Tayabas); Padre Don Silvestre de Villaseñor (born December 31, 1794); Doña Salvadora de Villaeñor (born March 178, 1798 and married Licenciado Don Pasqual Nepomuceno y Llamas, a prominent Manila lawyer from Pagsanjan); Padre Don Agustin de Villaseñor (born August 28, 1800); Doña Eufemia de Villaseñor (born March 3, 1802 and married Don Higino Sanchez); and Don Juan de Villaseñor (born June 24, 1805 and marries (a) Doña Rufina Santiago Tigmaque & (b) Doña Micaela Cajigal). In the 1850’s, the Villaseñor dropped the preposition “de” from their surname. 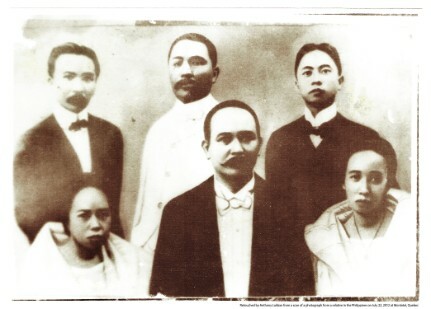 Like their Chinese forbearers, both the Villaseñors and the Cristobals prospered through their entrepreneurial activities, which included the purchase, clearing, development, and cultivation of agricultural lands as well as trading in rice, copra, and other commodities in the provinces of Laguna and Tayabas (now Quezon). Their social rise coincided with the economic prosperity of the Philippine economy to the late 18th to the 19th century as signaled by the official opening of the Port of Manila to international trade in 1834. They emerged as the two most influential Chinese meztiso families of Lucban and among the most prominent in the aforementioned provinces. To show their gratitude to the Divine providence, they engaged extensively in works of charity and put themselves at the service of the church. Many descendants became priests and nuns. On September 1, 1854, the Spanish Governor of Tayabas, Don Jose Maria de la O wrote the Governor General that “The Villaseñors are well known in the whole province and even in the capital (Manila) for the fine religious qualities which characterize the said family”. In that year, Don Pedro Nepomuceno Villaseñor, one of the clans most illustrious scions (son of Doña Salvadora de Villaseñor), founded the Casa Hospicio de Pobres de Lucban (Asylum of the Poor of Lucban), which according to Governor La O, “was probably the first one to be established in any of the provincial towns of these Islands”. In fact, it was the only charitable institution in its kind to be set up and administered by laymen in the Philippines during the Spanish Regime. For the perpetual sustenance of its poor residents, the Villaseñors purchased a fertile piece of rice land and donated it to the foundation.